Was lucky enough to pick up one and it arrived today! Got it adapted to my D810 via some SM2 tubing. Thread size isn't correct but it's possible to screw the adapter in. This lens is optimised for 2:1 with a 64mm image circle and 1:2 with 32mm image circle. I'm interested in both. 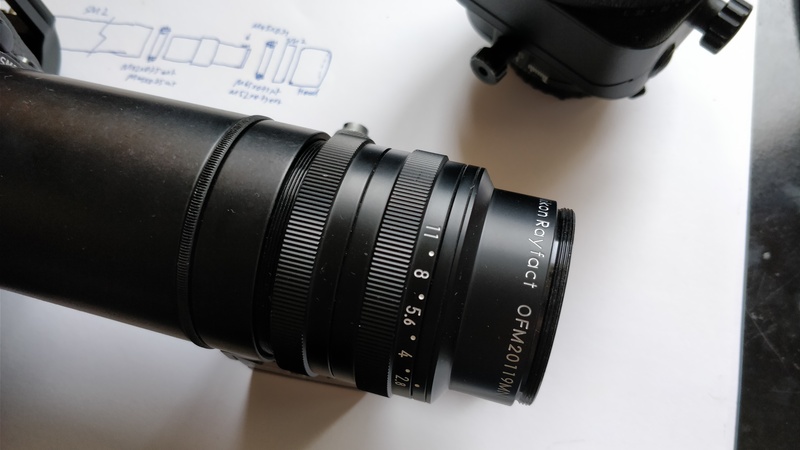 The price of that Schneider macro varon put me off, luckily I found this for a decent price. A staggering 87mm working distance at 2:1! Suitable for all kinds of lighting methods and shaping. Going to get the extension required figured out tonight. I'm away from home so the best I have would be some Chinese wafers to photograph. 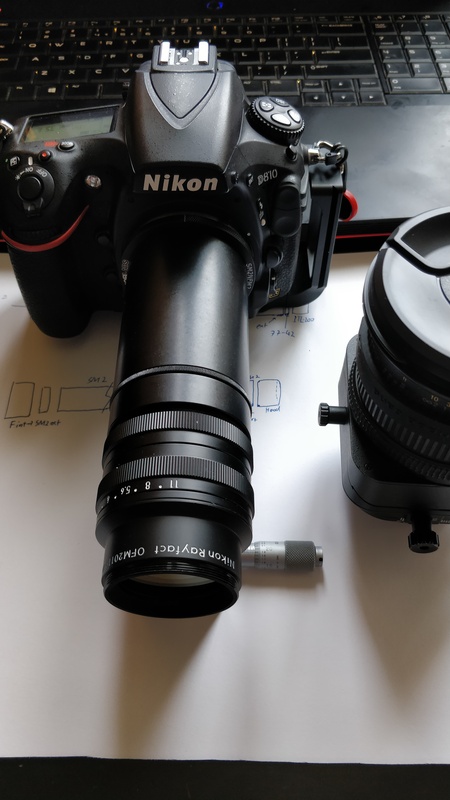 The NA of this lens is 0.119 at 2:1, whereas the Macro Varon is 0.11 probably at 2:1 as well. Looks like a Printing Nikkor actually (guess it actually is, same maker). I have the Schneider Macro Varon 85mm, got at a really good price. Accordsing to the description of Tochigi Nikon, OFM20119MN is essentially Printing Nikkor 90/2.8, as Klaus says, but it uses eco-glasses. So, the radius of the surfaces of some elements could be a bit different for the redesign. Sorry, yes, I meant 95/2.8. Yep, this is the Rayfact version of the legendary 95/2.8 PN, this one is rohs compliant. 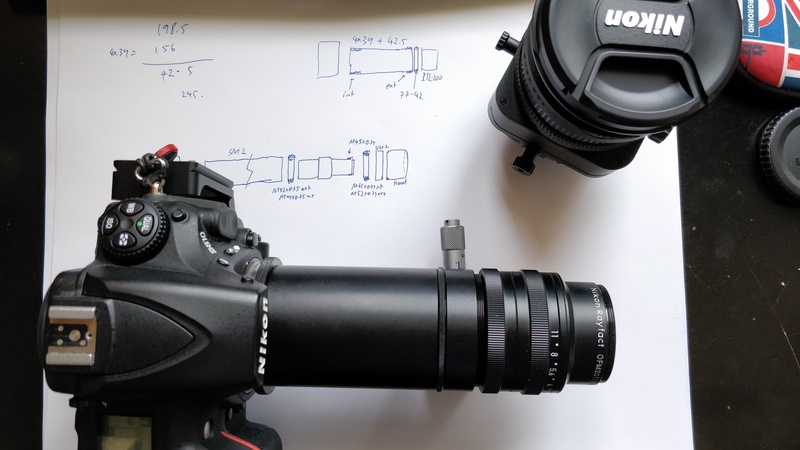 Having 2 magnifications for both ways of mounting seems to be popular among these types of line scanner lenses (see Linos inspec.x). I'll get some samples up when I come back to Australia. Currently in an apartment, can't get sharp results without a decent setup. Fair amounts of tubing was needed to reach 2:1. The resolution at 2:1 is insane however, being able to fully resolve the fine details in the wafers, down to those dense lines that many lenses struggle with even at higher magnifications (ie laowa 25mm). The big image circle would be great for some shift panorama stitching. I only have a Mamiya 345 auto-bellows now, sold off my pb-4 copies. Do be careful with Chinese sellers on eBay. Many simply steal photos from taobao and list the item at staggering high prices. If someone is unfortunate enough to make a purchase, they will just buy it off the taobao seller and flip for profit.